Muay Thai, also known as Thai boxing, or traditionally as the art of the eight limbs is a martial art and Thai contact sport, which is developed standing by means of blows with combined techniques of legs, arms, feet, knees , and elbows, in addition to some sweeps, restraints (to hit) and throws. 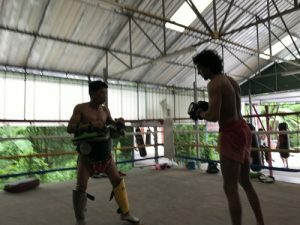 Its roots are in the Muay Boran, traditional variant and martial art (which include figures, open hand techniques, dislocations, throws and demolitions). Currently this discipline complements Muay Thai, along with Western boxing. Currently Muay Thai is usually considered an extreme sport, which favors the making of bets, and therefore a it is an exercise that is considered illegal in several countries, as in some states of the United States. Muay Thai training is considered the most effective fighting sport on foot. It is one of the disciplines most used in MMA. A word muay , which is translated as “combat”, “fight” or “boxing”, comes from the Sanskrit Mavya which means “to unite”. The word thai is the equivalent to the “Thai”, meaning “free person” (similar to the meaning of the term “frank”). The term “muay thai” is translated into Spanish frequently as “Thai boxing” and English as ”thai boxing camp “. • nak muay farang : (foreign fighter) used by western fighters. • Kru Muay or just Kru (teacher) coach. • Kai Muay (Field for muay) Center / training gym. Muay Thai comes from the ancient Thai martial art Muay Boran. Due to its antiquity, it is very difficult to date the Muay boran, some say it originated in 200 BC by Buddhist monks. It is an art destined mainly for war and only occasionally used in competitions. It is also very installed that originated from the krabi krabong, the complementary art to Muay boran.